This in from the great folks at Arts at St. Johns. Want to be in a musical? Have any stories to tell? Give them a shout now! WISH YOU WERE HERE – the history of Miami Beach – The Musical has plenty of opportunities for individuals, performers, organizations and businesses to be part of this show! 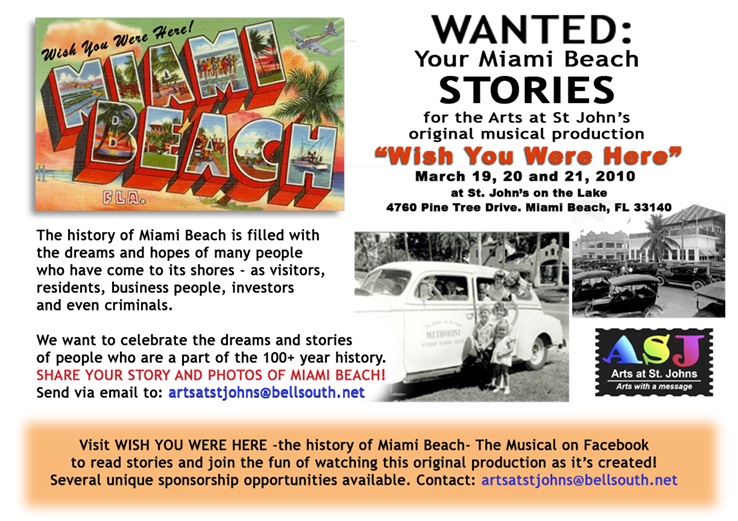 Please contact us if you have stories about living, working or visiting Miami Beach, particularly in its earlier years!! Mark Your Calendar Now!! March 19, 20 and 21, 2010!